How do you feel? Are you equipped to face the national and international media, and save your business from a public relations catastrophe? Or will you run for cover, and hide behind the most unconvincing response of all: “No comment”? 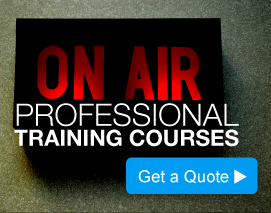 Group K Broadcasting Ltd, provides what we – and our clients – believe is the very best media training to help personnel at all levels handle the broadcast media, social media and press confidently, effectively and convincingly. Appearing on-air, being let loose on social media, or tackled by the ‘gentlemen of the press’ without professional media training is like driving round Hyde Park Corner in the rush hour without ever having had a driving lesson. Sheer madness! In business since 1974, we have unrivalled experience in radio and television production, and provision of news to the broadcasting industry. Broadcast, social media and press training are integral parts of our work. We have a diverse range of clients, from the Foreign and Commonwealth Office to Microsoft. CEO Allan King has worked in award-winning radio and television for more than thirty years and was a main presenter, or anchor, with Sky News for 15 years. A major strength of our business is our policy of employing only professionals with thorough experience and an excellent track record in their field. For example, our broadcast trainers are all well-known radio and television interviewers who also posses the ability to impart their knowledge to others. We are not merely another media training company, but an active part of the broadcasting, social media and press industries. A fact that makes our training unbeatably authentic.